I love this game. It is the best DS game I have. I like it because horses and ponies are my favorite animals. Anyone who loves horses and ponies should get this game. You get to pick out of a variety of horses and you get to name it anything you want. You can do dressage, jumping, and cross-country. You can also do trail riding when not busy. Or you van go into the chat room to talk to the people in it. After 6 weeks of practicing you have a competition. If you don't get past it you have to do week 6 again. With the money you earn you can things for the person and your horse. I am on week 6 right now and I am having so much. But dressage is kind of hard so watch out. I haven't actually played this game but it sounds exactly like pippa funnel (the first one). if it is it's a good game but disappointing when you finish because you can't ride anymore. and training the foal takes forever. Is it worth buying? 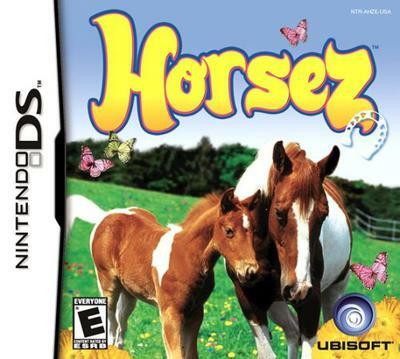 or is Petz Horsez 2 better? It's very hard to complete. your at a boarding school and have to do jumping, cross country, and dressage. as you end the week you can get held back which stinks because you have to repeat part of the storyline. once you beat the game your horse disappears and you no longer get to ride but you can still train ur foals. it's ok but hard though. I really want to try this game it sounds like so much fun!!!! oh gosh the game itself and the music are exquisite. such a good plot as well. and they mention jade in this game. jade is from a game called champion dreams for PC and ginger (the girl you play as) is a friend of hers in champion dreams. and the music i find myself humming to it way too much. i have this game and it is probably my favorite ds game in my whole cupboard of ds games! I've passed the game twice, it's a good game but I think there are too little levels. The graphics are quite good and it's very fun..
yes, I have horses but I don't enjoy it. I got frustrated with dressage but I loved jumping. Return to Review Nintendo DS Horse and Pony Games.